Russian Doll is the newest big thing from Netflix, and it is also a very nice slice of sci-fi. Without getting too spoilery, the main character, Nadia, gets stuck in a time loop. We meet Nadia Vulvokov, at the start of episode one, washing her hands in the bathroom at her birthday party, and each time she dies, she is sent back to this bathroom, like a save point. It’s great show, everyone is talking about it, and I have no compunction about recommending it to anyone, whether they usually like sci-fi or not. From here on, things get super spoilery, so make sure you see the show before reading any more of this particular post. The show is about a time loop, which is a hoary old sci-fi trope, where a character is doomed to repeat a period of time over and over, until something is corrected. Only one or two characters realize what's going on, while everyone and everything else undergoes a complete Snap Back, and if not interfered with will do the exact same things every time, right down to dialogue. The character in the loop usually starts experimenting, exploring, and getting themselves killed in interesting ways before finally getting down to the business of what's causing the loop, and how to stop it. This all happens in Groundhog Day and Happy Death Day, and it happens in Russian Doll, too. In Groundhog Day, I Got You, Babe, keeps eternally playing, while in Russian Doll the song is Harry Nilsson’s Gotta Get Up. 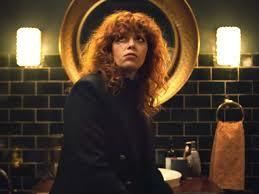 Russian Doll follows the usual template pretty closely but it throws in enough interesting stuff to breathe new life into it. The first thing that makes this such a great show is the setting. 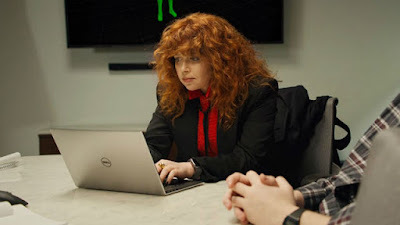 Natasha Lyonne, Leslye Headland, and Amy Poehler created the show to be basically about a woman at a party, and it is a great party. It’s a cool, bohemian celebration thrown by her friends Maxine and Lizzy, in a giant loft in a building that used to be a yeshiva. The place looks like it could only be bought by a millionaire, and the guests are artists, intellectuals, and other creative types. The place is filmed in gorgeous, saturated colors, with beautiful people as extras, and it makes you want to be at the party along with Nadia. The party is so central it becomes a character in the show, but the birthday girl is a great, great character too. Nadia is a wisecracking hipster, with an acerbic New York type of wit. She is hedonist but she is also very interested in death, describing her birthday as “staring down mortality like the barrel of a gun”. 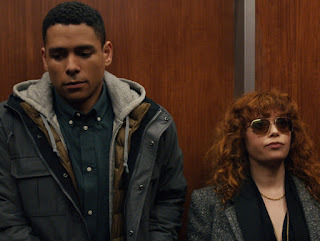 In this show, Natasha Lyonne’s addict persona is the heroine, who is magnetic and it is hard to take your eyes off her long enough to take notice of the little details scattered around the story that shift as the complex timeline of the show gets more convoluted. Nadia is a game designer and she moves through the show as if she is moving from level to level in a sort of video game, but also like she is moving through the steps of a program of therapy, but the game is too difficult ever to beat, or the therapy is not a journey with an end point. Each episode is like a level in the video game, each dealing with mortality and grieving, and constantly changing through inventive plot twists. There are elements of magical realism, and these are intended to be like laughing at trauma in an attempt to deal with it. For example, there is a homeless man named Horse, who can be seen as the god Pan. He lives in the woods in Tompkins Square Park, and he is all of our unconscious or subconscious selves. 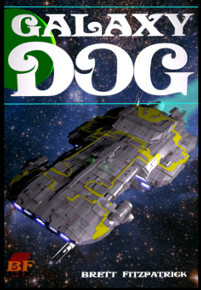 One moment he is an ally, the next he is a threatening presence at the edge of Nadia’s safe world. By the end of the season, Nadia reaches a very satisfying resolution, though the show was designed to span three seasons so some mysteries must still be in store.I will be tuning in to find out what they are.